As the housing selling season winds down with the end of spring and the beginning of the summer months, it is a good time to get informed perspective of housing demand for the year. This can be gleaned from three major metrics; mortgage purchase applications, existing home sales and new home sales, year over year (YoY). Six months of data for the first indicator, mortgage purchase applications, shows applications significantly down compared to the same period last year. 1. 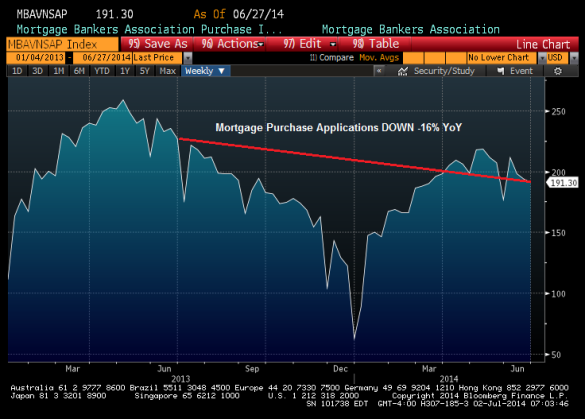 Mortgage purchase applications are down -16% YoY. Mortgage demand has been soft since interest rates rose in May of 2013. Even though we saw the typical seasonal pick up on total volume for the first half of the year, year over year purchase applications have been down double digits.